West Virginia Senate Declines to Vote on Raises for Striking Teachers - Integration Through Media ....! 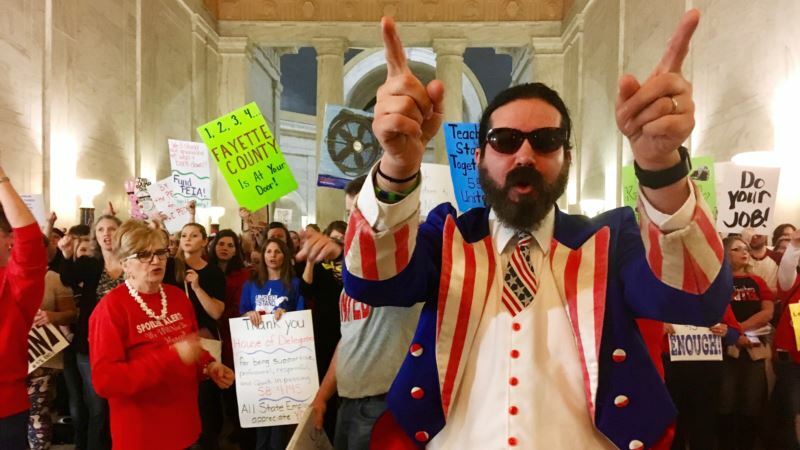 (VOA): The fate of a seven-day teachers strike in West Virginia lay in the hands of the Republican-controlled state Senate, which refused Friday to even vote on whether the teachers should get a 5 percent pay raise. Hundreds of teachers and supporters, including students, rallied at the Capitol, pressuring lawmakers to approve the settlement negotiated earlier this week by Governor Jim Justice and union leaders. That deal included the raise for teachers, school service personnel and state troopers. Teachers are protesting pay that’s among the lowest in the nation, rising health care costs and a previously approved 2 percent raise for next year after four years without any increase. “We’re still not close to resolving this critical issue,” said Senator Roman Prezioso, the Democratic minority leader, requesting a vote Friday. “Let’s send the teachers and superintendents that I’ve seen here from all the different counties, send them home this weekend for a cooling-off period. Let’s start school Monday and say this Senate does support education in West Virginia.” Majority Leader Ryan Ferns moved to table the matter without comment. The Senate’s Republicans did that, carrying the 20-13 vote. That left the bill in the Finance Committee, which has begun drafting a budget for the next fiscal year and could work through the weekend on some alternative. Saturday session The Senate later adjourned and planned to meet again Saturday. Justice told school superintendents gathered at the Capitol that he believed the votes for the raise were there. “If they don’t do it tomorrow, we spiral off into no man’s land,” he said. Senate Republicans have repeatedly emphasized spending restraint while saying the teachers and West Virginia’s other public workers are all underpaid but funds are limited. Protesting teachers countered that there are other potential funding sources and that education of the children in West Virginia — where more than 700 classrooms lack fully certified full-time teachers — needs to be a higher priority among politicians. Pay starts at about $33,000 a year, lower than in surrounding states. The Republican-controlled House approved the raises, voting 98-1 on Wednesday. The Senate, by voice vote later Friday, rejected an amendment to natural gas legislation that would have added a 2.5 percent fee on producers’ gross proceeds. Receipts would offset rising costs for all workers covered by the Public Employees Insurance Agency.